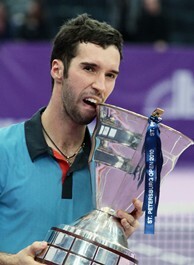 Mikhail Kukushkin of Kazakhstan poses with the trophy after defeating Mikhail Youzhny of Russia in the singles final of the International Tennis Tournament. ST. PETERSBURG, Russia (AP) Mikhail Kukushkin won his first title in his first attempt, upsetting top-seeded Mikhail Youzhny 6-3, 7-6 (2) Sunday in the final of the St. Petersburg Open. Kukushkin's previous best result was a semifinal appearance in Moscow last season, where he lost to eventual champion Youzhny in straight sets. The 88th-ranked Kukushkin broke the 10th-ranked Youzhny twice in the first set. After an exchange of breaks midway through the second set, Youzhny broke in the 11th game and served for the set. But Kukushkin broke back to force a tiebreaker. In the tiebreaker, Kukushkin took a 6-2 lead and sealed the win on his first match point. Youzhny, who saved a match point in the quarterfinal and four more in the semifinal, said he was exhausted going into the tiebreaker. Kukushkin is expected to move to a career-high top 60 in the rankings next week.